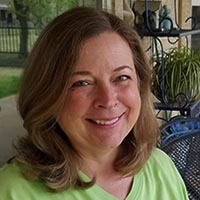 Over the holidays, I discovered Whole Foods 365 Pumpkin Spice Granola. It was deliciously yummy, but sadly only available during the winter holidays. 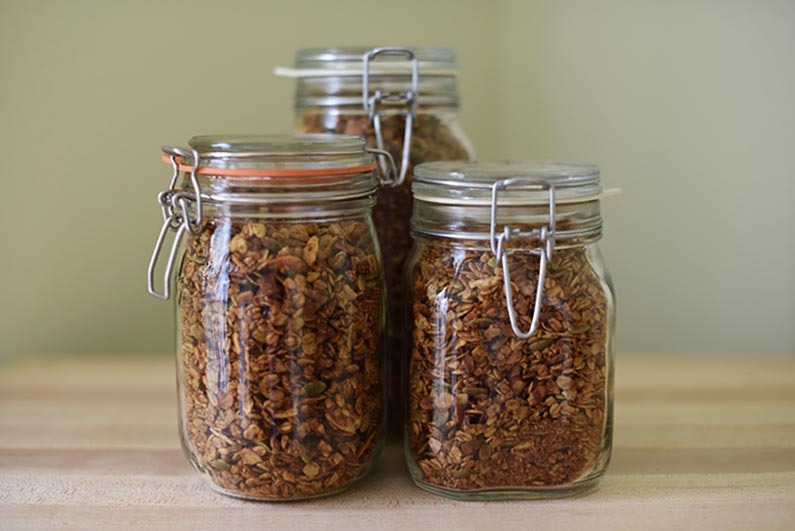 So, I decided to experiment with Tara’s Homemade Granola to see if I could make my own Pumpkin Granola that I can enjoy all year. I mixed pumpkin puree into the wet ingredients to add the rich flavor of pumpkin. To the dry ingredients, I added pumpkin pie spice with its blend of cinnamon, nutmeg, clove, and ginger. 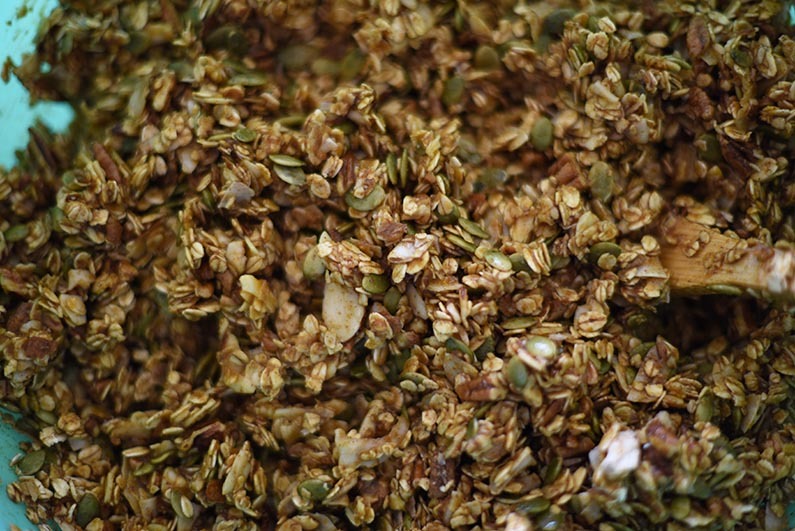 I, also, added Pumpkin seeds to the dry ingredients to up the pumpkin flavor and crunchiness. I mixed the dry and wet ingredients together. After the wet and dry ingredients were fully combined, I poured the granola onto 2 baking pans. 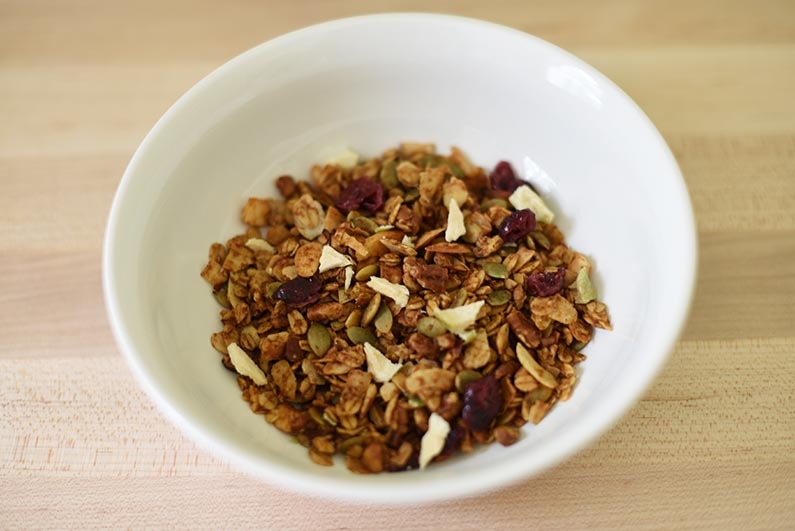 The granola baked for 1 hour at 300° F. Be sure to stir it every 15 minutes. 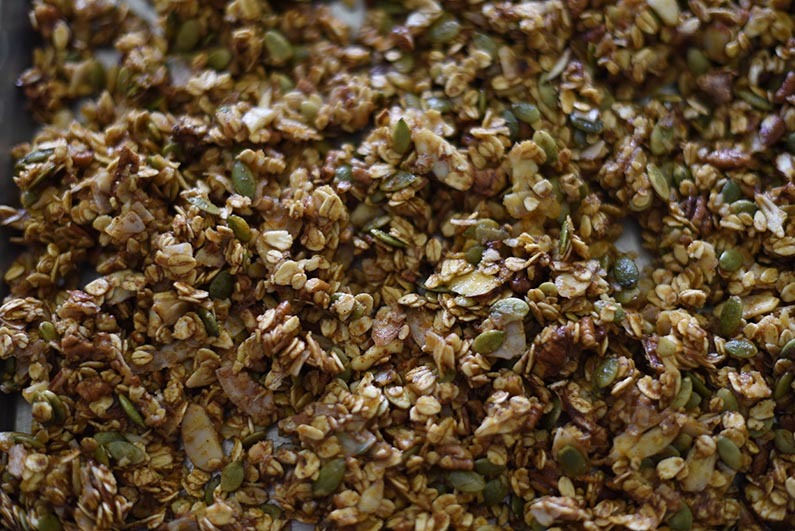 Remove the granola from the oven and cool it completely on the baking pans. I stored it in air tight, glass containers. When I pour out the serving that I’m eating at one time, I add the dried cranberries and apples to it. I like my Pumpkin Granola with either almond milk or vanilla yogurt made with coconut milk. Or I eat it right out of the jar as a snack. 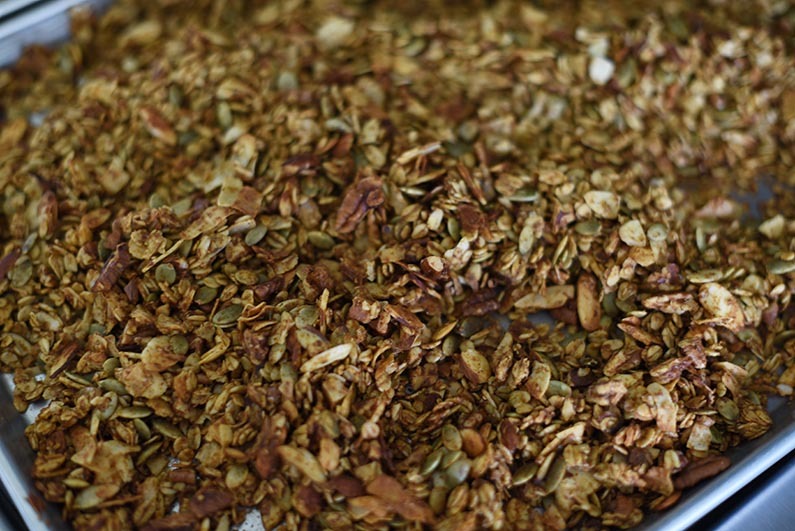 I hope you enjoy my Pumpkin Granola as much as I do. Cheers! 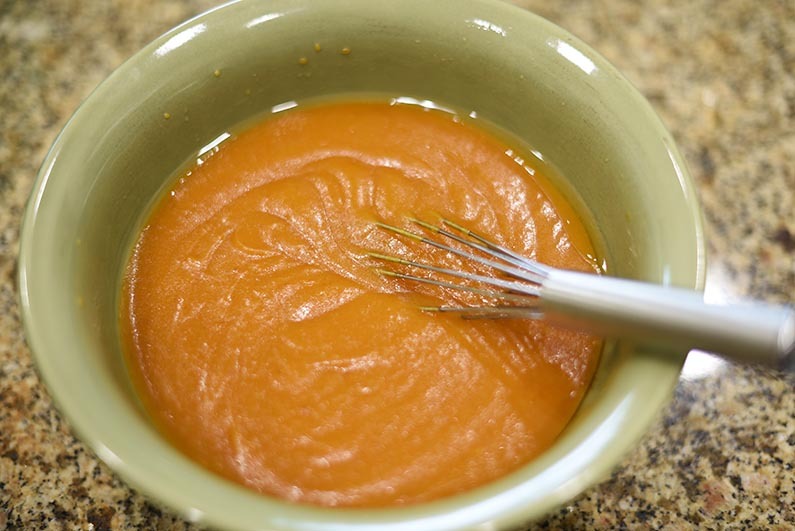 Whisk together olive oil, honey, and pumpkin puree in a medium bowl. 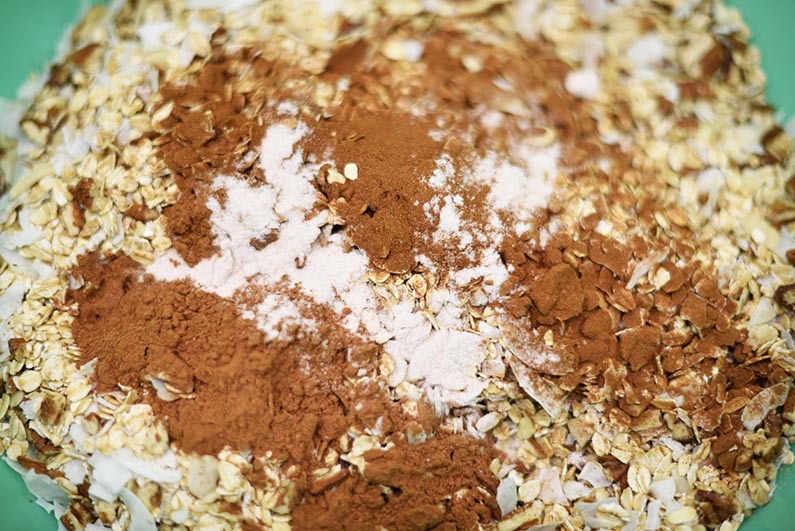 Mix together oats, coconut, nuts, pumpkin pie spice, cinnamon, and salt in large bowl. Spread evenly on 2 baking pans lined with parchment paper. Bake until golden brown - approximately 60 minutes - stirring every 15 minutes. Cool completely on baking pans. 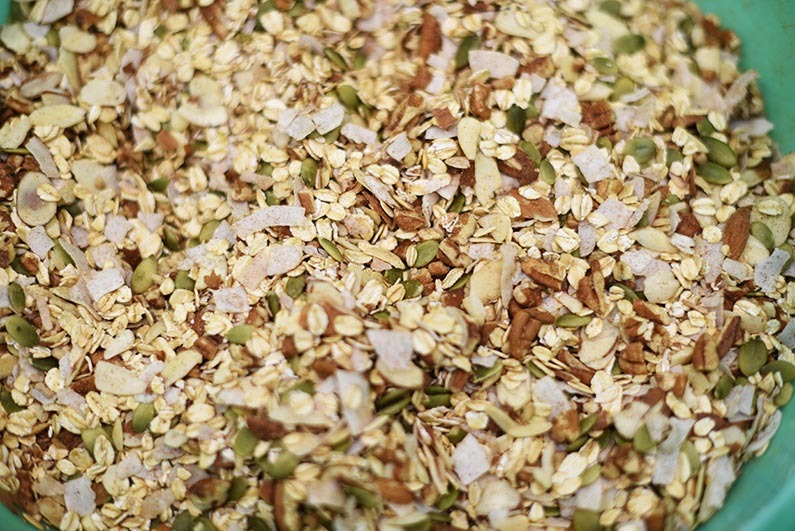 Store granola in air tight container. Add dried fruit when eating.